After installing Avast Antivirus and restarting your PC, you are immediately protected. 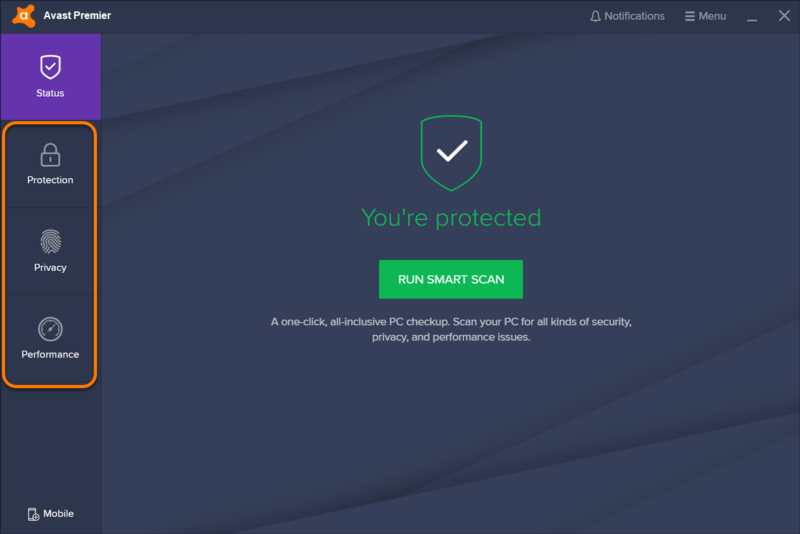 To access certain Avast Antivirus features, for example manual antivirus Scans, Virus Chest, or Settings, open the user interface by following the steps in the sections below. Double-click the Windows desktop icon of the installed Avast Antivirus software. Right-click the Avast system tray icon on your Windows taskbar, and select Open Avast user interface. Click a tile in the left panel to explore Avast's features. The Avast user interface is now open. Avast Antivirus settings are configured to suit most users, however you can manually set your own preferences in the Settings. Click ☰ Menu in the main user interface of Avast Antivirus and then select Settings. Click the relevant tile in the left panel, or Search for your preferred setting. You can now configure Avast settings.